Are prejudice, bigotry, and racism the same thing? No. And this is a HUGE source of misunderstanding. Prejudice is when a person negatively pre-judges another person or group without getting to know the beliefs, thoughts, and feelings behind their words and actions. A person of any racial group can be prejudiced towards a person of any other racial group. There is no power dynamic involved. Bigotry is stronger than prejudice, a more severe mindset and often accompanied by discriminatory behavior. It’s arrogant and mean-spirited, but requires neither systems nor power to engage in. Racism is the system that allows the racial group that’s already in power to retain power. Since arriving on U.S. soil white people have used their power to create preferential access to survival rights and resources (housing, education, jobs, voting, citizenship, food, health, legal protection, etc.) for white people while simultaneously impeding people of color’s access to these same rights and resources.Though “reverse racism” is a term I sometimes hear, it has never existed in America. White people are the only racial group to have ever established and retained power in the United States. Below is a prime illustration of racism. 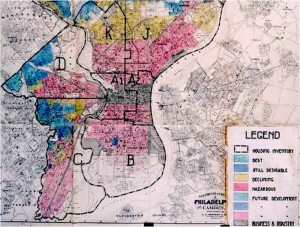 This Philadelphia map created in the 1930s by government and lending agencies indicates various neighborhoods’ financial risk level. White policy makers considered race as much of a risk factor as a building’s condition. These risk levels allowed white people like my family to buy into “best” neighborhoods with the lowest mortgage rates while leaving people of color behind in “hazardous” neighborhoods. The linked cycles of advatange and disadvantage gained traction as white people in “best” neighborhoods accessed better education, food, jobs, heathcare and home equity growth while people of color in “hazardous” neighborhoods suffered inferior education, food, jobs, healthcare and zero or declining home equity. The housing footprint created by these policies is largely intact today. To learn more about the above practice, called redlining, click here.